If you’ve been tasked with hosting the family holiday dinner this year, don’t stress over oven space when making your side dishes. 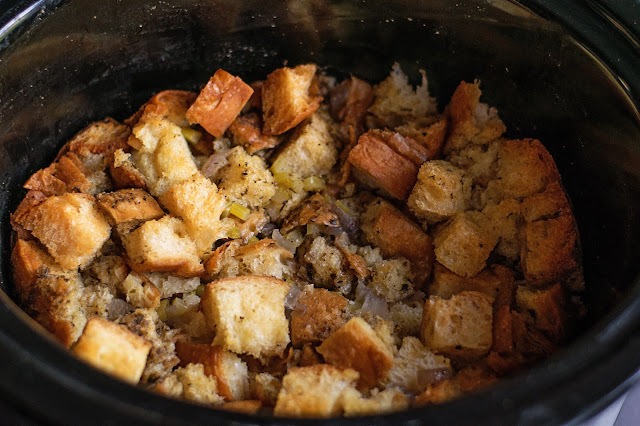 Learn how to make Stuffing in a Crock Pot to free up some of that oven and stove top space. One of the most terrifying things a person can say to you around the holiday season is “Will you host the family dinner?”. Immediately panic and stress ensue. Questions begin ringing through your head like “What will you make?”, “How will you plan it all out so that everything comes together in time?”, and “How will you make all of this food with one oven?”. But I’m here to tell you that is doesn’t have to be that way. Some of these traditional classics can actually be made using your Crock Pot. Take my Crock Pot Stuffing for example. Just simply place everything into the Crock Pot, set the timer, and forget about it! It’s just that simple and I can’t wait to share with you exactly how I do it. Because we are wanting to keep things stress-free, we are going to making a simple bread stuffing. 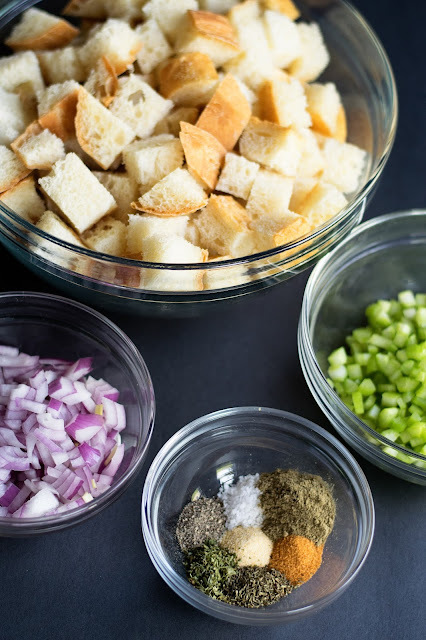 I like to use a loaf of French bread, cut it up into bite-sized cubes, some celery, onion, and various spices. Of course you can buy the bags of croutons for this recipe. That would be totally fine. But this is a holiday dinner. Take the time to make homemade ones. Simply place the cubed french bread onto a baking sheet, place it in a 300 degree oven for 15 minutes, then turn the oven off and let the tray sit in the oven for another 30. 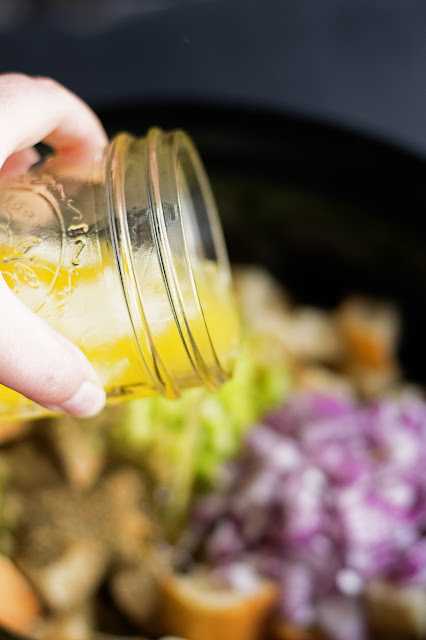 They will be perfectly crisp, just right for this Crock Pot Stuffing. 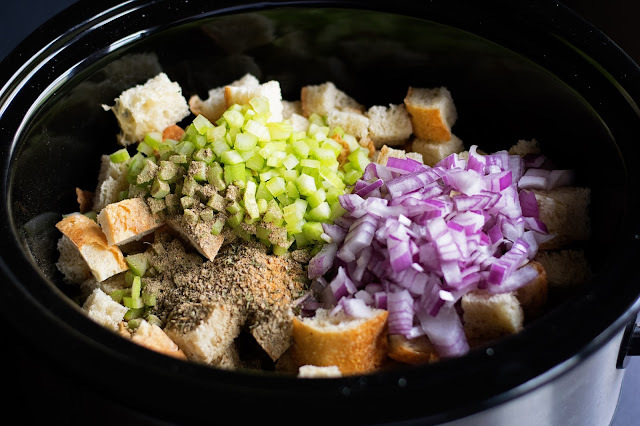 Now you can place the bread cubes, celery, onion, and spices into the Crock Pot. Pour the melted butter all over the stuffing ingredients. Next pour the chicken broth over all of the stuffing ingredients. Now place the lid on your Crock Pot, turn the heat to low, and let it cook for 4 to 5 hours. After 4 to 5 hours, this is what your stuffing will look like. Soft and moist, with little crispy bits around the edges. Just what a great stuffing should be. Give everything a little toss and you are ready to serve. You can serve this delicious holiday side dish right out of the Crock Pot or put it in a family heirloom bowl like I did. 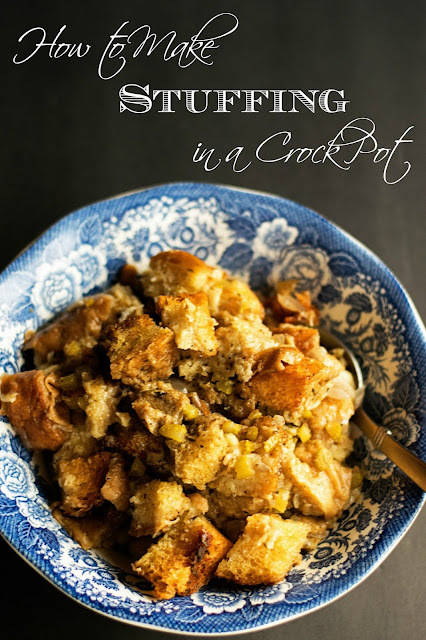 Either way, this Crock Pot Stuffing is delicious and is nearly effortless. So the next time someone approaches you to host the family dinner during the holidays, don’t stress. You’ve got this! And for other simple holiday recipes check out my Herb Butter Roasted Turkey, Homemade Noodles, Homemade Dinner Rolls, and Country Style Green Beans. 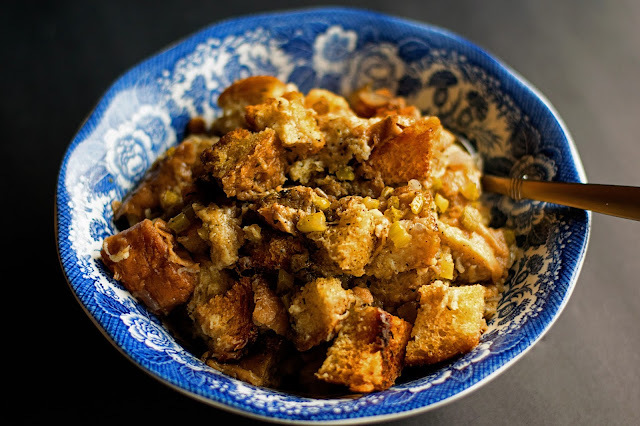 A delicious recipe for a perfect bread stuffing that can be prepared in your Crock Pot! It's sure to be a hit this holiday season. Cut the loaf of French bread into small cubes. To dry, place on a baking sheet and into a 300 degree oven. Then turn the oven off and leave the bread in the oven for 30 minutes. Remove from the oven and place into the Crock Pot. Add the celery, onion, and spices to the bread in the Crock Pot. Pour the melted butter over the bread and spices in the Crock Pot. Pour the chicken broth over the bread and spices in the Crock Pot. 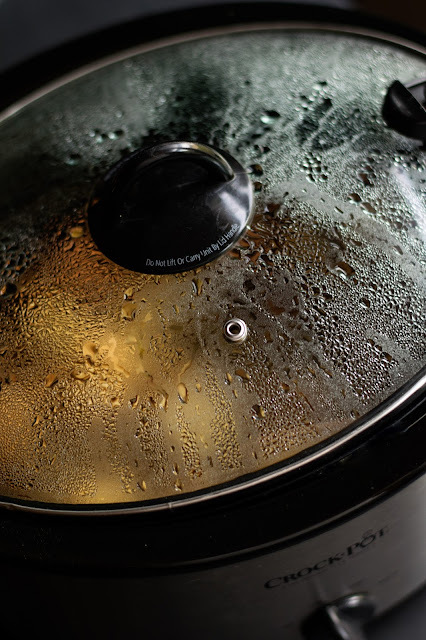 Place the lid on the Crock Pot, turn the heat to low, and cook for 4-5 hours. After 4-5 hours, stir the stuffing, and serve. 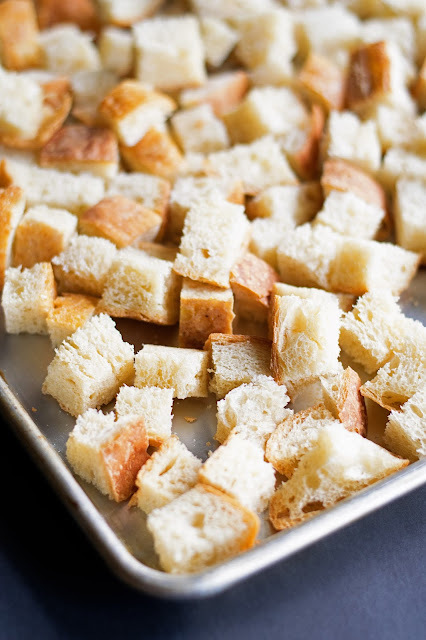 *You can also use store bought croutons, approximately 8 cups. 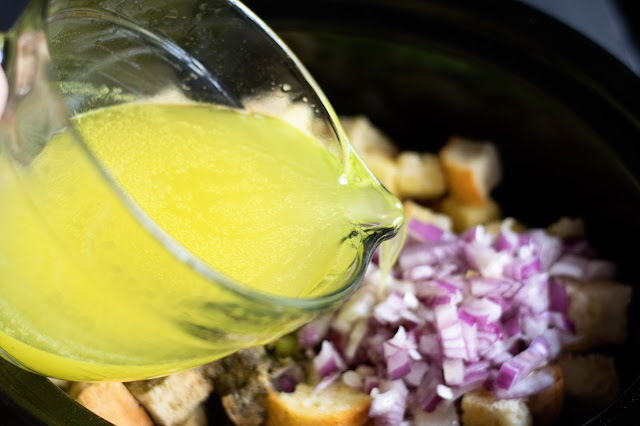 We hope you love this recipe for Crock Pot Stuffing from SoFabFood Contributor, Mandee Pogue from The Kitchen Wife, as much as we do. If you enjoyed this simple holiday side dish, be sure to subscribe to our newsletter so you never miss another one like it. For daily recipe inspiration, like us on Facebook, follow us on Pinterest, and stop by our Google+ Community to see all of the amazing recipes our community members are sharing for the holidays. Enjoy! Lover of God, wife of John, mother of dogs, cooker of food, writer of blog, and made in West Virginia. I write over at thekitchenwife.net where I share my favorite recipes and stories from this thing I call life with you and yours.